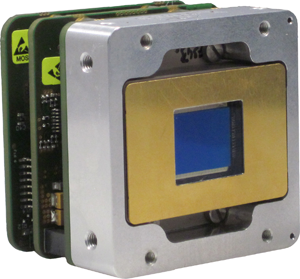 The XSW-320 Gated SWIR OEM module operates in the 0.9 to 1.7 µm spectral band and provides extremely short integration times (down to 100 ns). It's InGaAs detector has a resolution of 320 x 256 pixels and a pixel pitch of 20 µm. A special feature of the XSW-320 Gated is the programmable trigger-out delay between the internally generated trigger-out pulse and the start of integration. The exposure time of the sensor is configurable from 100 ns up to 1 ms in steps of 100 ns, or 1 ms to 40 ms (standard mode). With all these features, the XSW-320 Gated is the perfect SWIR OEM module for SWIR gated imaging, the inspection of light bulbs and SWIR imaging of hot or fast moving objects.